The 2012 Northeast Grange Youth/Junior Conference will be held on Friday, July 13, 2012 to Sunday, July 15, 2012 at the Eastern States Exposition (also known as the "Big E") Fairgrounds in West Springfield, Massachusetts, hosted by the Connecticut State Grange. Grange members of all ages from across New England and New York are invited to attend this fun-filled weekend. The conference will include three days of workshops and fun activities for Grange members of all ages. Some of the activities include a pizza party and movie on Friday evening, a visit to the Springfield Museum, talent competitions, the banquet and awards on Saturday, and on Sunday, an inspirational service followed by the highly popular Drill Team competition. Something new this year will be the "Spirit Stick." Connecticut First Lady Jody Ann Cameron and her father were gracious enough to make this beautiful Spirit Stick. The concept behind this is to see which Junior/Youth State Grange has the most Grange Spirit. It can be by all wearing the same t-shirts that promote the Youth/Junior Program or it can be sharing with other states what each State does to get the word out about Grange. On Sunday, the Spirit Stick will be awarded to the State that showed the most Grange Spirit. The winning State will be able to keep the Spirit Stick for one year (along with the bragging rights!) and will have to bring the Spirit Stick the following year to the conference where it will again be awarded to the State that has the most Grange Spirit. Registration forms and the complete information packet is available on the Downloads page of the Connecticut State Grange website: www.ctstategrange.org/Downloads. For more information, contact Connecticut State Grange Youth Director Lisa Lamoureux by email at youth@ctstategrange.org or by phone at (home) 203-238-1510 or (cell) 203-868-8712. 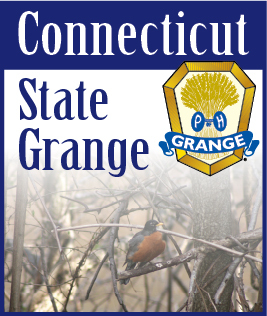 The Connecticut State Grange has been an integral part of rural and non-rural communities across the state for over 125 years, with currently nearly 60 local Grange chapters in Connecticut. Local Granges are committed to bettering their communities through service projects and family orientated activities. For more information on the Grange in Connecticut please visit www.CTStateGrange.org.